Fossil Boulder is the most notable feature of Auburn Township Park southeast of Auburn. 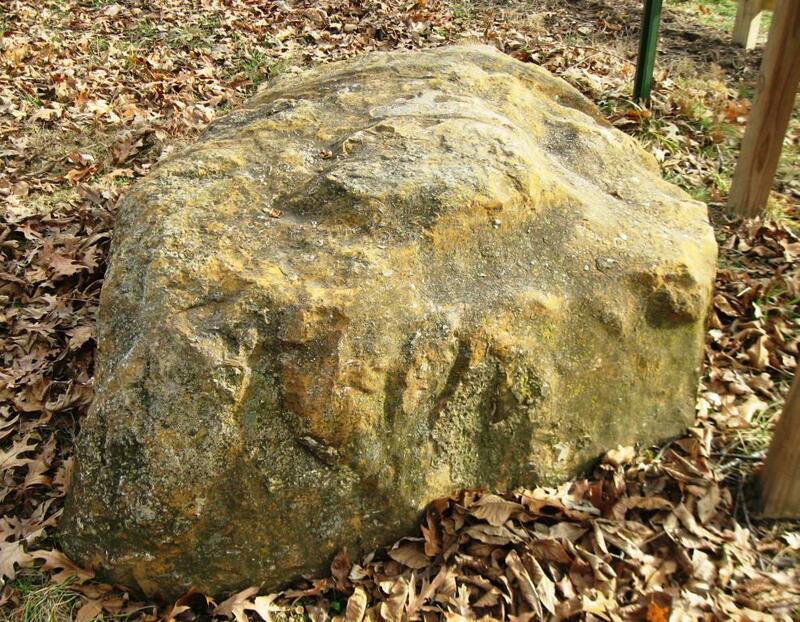 The boulder was unearthed in the mid-1980s in Auburn itself, according to a sign at the park. Information on the sign was researched by Marilyn “’lyn” Pignon of Auburn in 2014. This boulder emerged at a depth of 18 ft. during the excavation … of the City Pond several hundred feet north of a pond filled in to create a 2nd ball field in Veterans’ Park (in) Auburn. The filled-in-pond came into existence in the latter part of the 1800’s from clay diggings at the Brick and Tile Factory in operation at that time. Such fossil boulders as this one are quite common in our region. Layer upon layer of clay of various colors and minerals consistent to strata below the black top soil in our area yield such fossil boulders. 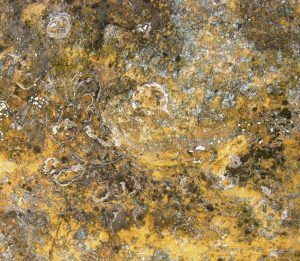 Fossils in this boulder are the remains of dead invertebrates, vertebrates and plants fossilized by “rapid burial from water-borne sediment” altered by minerals that aided in their preservation process to become part of the earth’s crust. The prominent coils of fossilized worms (Rotularia) amassed on top of this boulder would have lived in a marshy environment and may have been swept together by a storm surge. A map, also created by ‘lyn Pignon, shows the trails of Auburn Township Park. 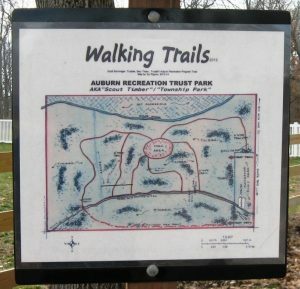 Auburn Township Park is a small park mainly devoted to walking trails. It also has a picnic shelter, a couple of tables, a minimal playground and a concrete-block toilet facility. The park apparently was created sometime before 1981; SangamonLink was unable to determine exactly when. It can be reached by taking Bab Road south from Illinois 104 east of the city of Auburn. This entry was posted in Communities, Parks, Prehistory. Bookmark the permalink.